Never Enough Nails: China Glaze Electric Nights Summer 2015 Swatches, Part 3! China Glaze Electric Nights Summer 2015 Swatches, Part 3! Today I have swatches of the rest of the China Glaze Electric Nights polishes that I got (for now...). I say "for now" because there are only two more neon cremes in the collection, a pink and a yellow, and I think I might just have to get them too! 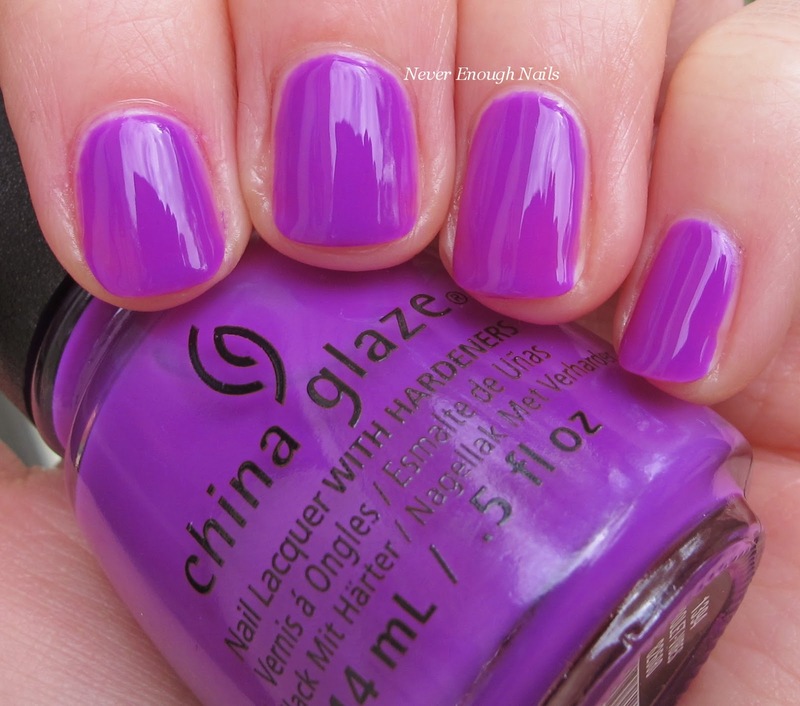 China Glaze Violet Vibes is a fantastic red-toned neon purple creme. This is definitely a true violet, because it does have the more pinky red tone to it, rather than blue tones. It is much more vibrant and bright than my pictures show. I LOVE this one! It's really like a neon purple-y fuchsia. Definitely different than other bright or neon purples I own. This is three thin coats of Violet Vibes. Two thicker coats coat probably do as well. The formula was pretty good for this one, not streaky and a good consistency. 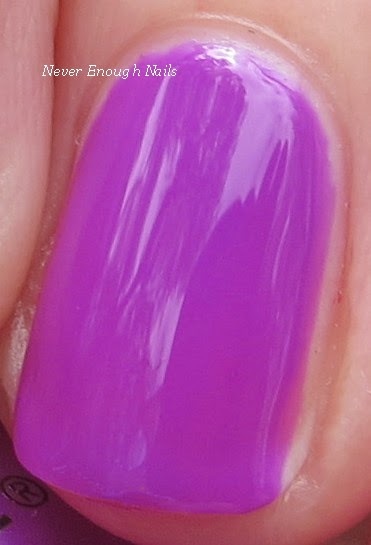 China Glaze Treble Maker is another beast to photograph, but such a great color! Treble Maker is a neon spearmint green creme. It's less pastel and sea foam green than my pictures make it look, more like a really glowing light grassy green. This is an attention getting shade for sure. Being the green and neon polish lover that I am, this is a win for me! This is three thin coats of Treble Maker. I think it needed the third coat for evening out any streaks and for opacity. It was a little streaky on the first coat, but evened out in the end. The consistency was good, not too think nor too thin. 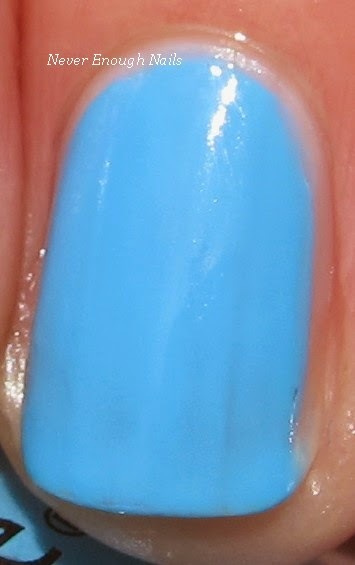 China Glaze UV Meant To Be is a gorgeous bright blue creme. I'm not sure it's really a neon, it looks more like just a very bright blue, but it is insanely gorgeous. At first I thought this might be close to my beloved China Glaze Bahamian Escape, but it is greener and less pastel/white-based than Bahamian Escape. They are both really great blues, so I am happy to own them and I may start to use UV Meant To Be instead of BE sometimes so I can make BE last longer! This is two coats of UV Meant To Be. The formula seemed a bit thicker than the others in this collection, but it was still pretty easy to use. Just remember to let each coat dry before applying the next to avoid streaking. My personal top favorites from the seven Electric Nights polishes I have are Treble Maker, Red-y to Rave and UV Meant to Be. However, I really love all seven and I think I'm going to get the other two neons in the collection. They are the best neons that I have tried since wayyyy back when China Glaze first came out with Pool Party and Flip Flop Fantasy, and the formula of all of these is WAY better than Pool Party and FFF. The fact that these don't need a white base to really pop is amazing. I hope this is the start of China Glaze rocking hard again!! The China Glaze Electric Nights collection is available now at Ulta, Sally Beauty and other salons. I got mine at nailsupplies.us.